With two weeks on the clock, let's go. Packing in a total of 4 Latin heavyweights, this trip will take you from the heady heights of La Paz, to the colonial beauty of Salta, via Incan ruins, Bolivian salt flats, bubbling hot springs and colourful flamingos. We're excited - are you? Kick start your adventure over dinner and a Pisco Sour with your new Contiki fam, getting excited for 15 days of natural beauty, exquisite local dishes and fun times galore. 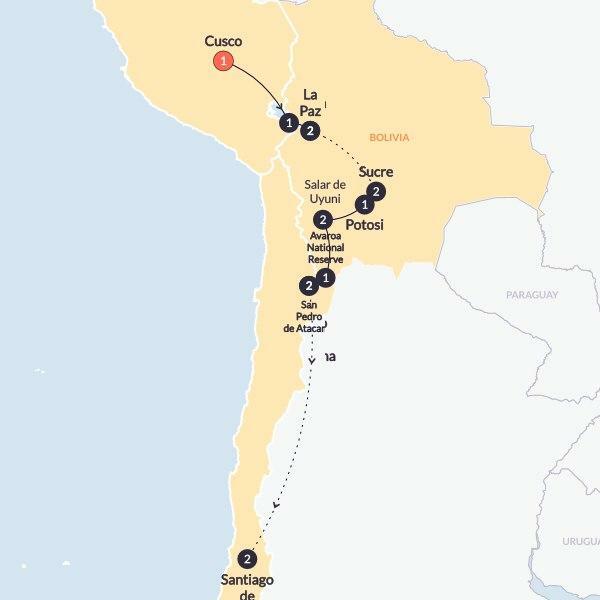 Bolivia, you're in our sights. Filling up on breakfast, it's all eyes to the border as we make our way through Peru's spectacular Altiplano Plateau and over the border to Lake Titicaca, iconically the highest body of water in the world (and said to be the original birthplace of the Incas).Small, bright and enchanting, Copacabana sure as hell turns on the charm. Situated on Lake Titicaca's shores, this is more than just a place with sandy beaches and lakeside cafés. Opt for a cultural walk toward the Basilica of Our Lady Copacabana, or shop for local goods in its famous shopping street. Today we'll journey through the pretty Bolivian countryside towards La Paz. Situated a slightly unnerving 12,000 ft above sea level (yeah, for real), this city is big on altitude AND energy.If you're looking for vistas, La Paz is your gal. Sitting in the midst of a narrow canyon and dwarfed by the mighty icecapped peak of Mount Illimani to the South, this is a city of contrasts, where 19th century churches rub shoulders with towering office blocks and pretty, colourful markets. Take your time adjusting to the altitude, then make the most of your afternoon in this hustling, cosmopolitan city. The day is yours. Choose to visit the colorful, hillside city of Valparaiso or spend a day exploring Chile’s wineries. This morning your trip ends. Not ready to say goodbye to South America? Why not join us on our Argentina and Brazil Experience? You and your new amigos will be spending your nights in hotels, jungle lodges, and cool hostels right amongst the action.